Our comfortable ABC. Photo Fergal Savage. Heading up to the high camps of Cho Oyu. Photo Vicen Jolis. Members heading down after a successful summit. Photo Vicen Jolis. Fergal Savage on the summit. Photo Fergal Savage. Member enjoying at camp 2. Photo Grace McDonald. Holly, Patch , Tenji and Ngima on the way to Camp 2. Photo John & Debbie. Members enjoying inside the dining tent. Photo Max. Members enjoying in Basecamp. Photo Max. Dates: 29 August - 5 October, 2019 or 5 April to 12 May 2020 Or 30 August, 2020 - 6 October, 2020 (ask about flexible start dates) . 38 days in Tibet and Nepal. Combine Shishapangma with Cho Oyu and earn a 20% discount. 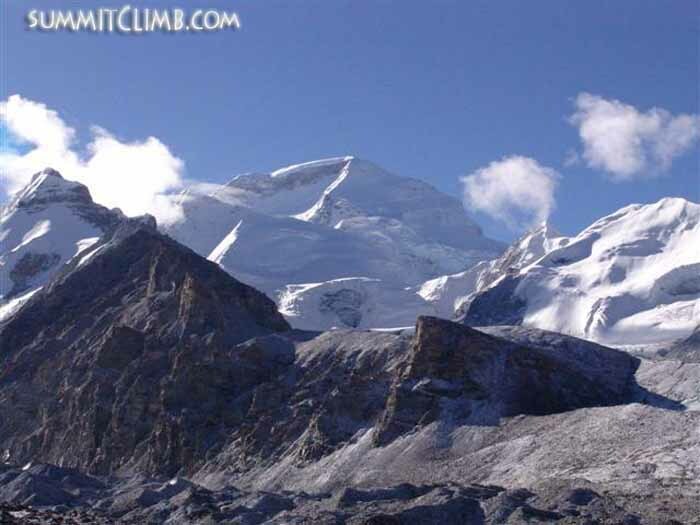 At 8,201 metres (26,906 feet), Cho-Oyu is the 6th highest mountain on the planet. 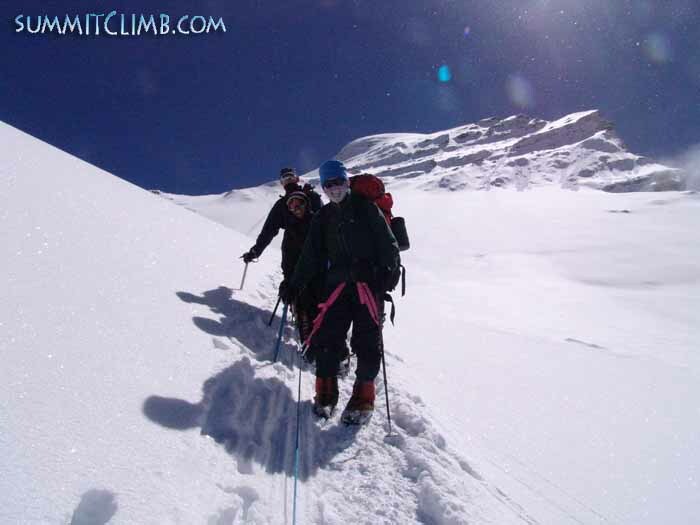 It is considered to be one of the easiest and most accessible 8,000m peaks. 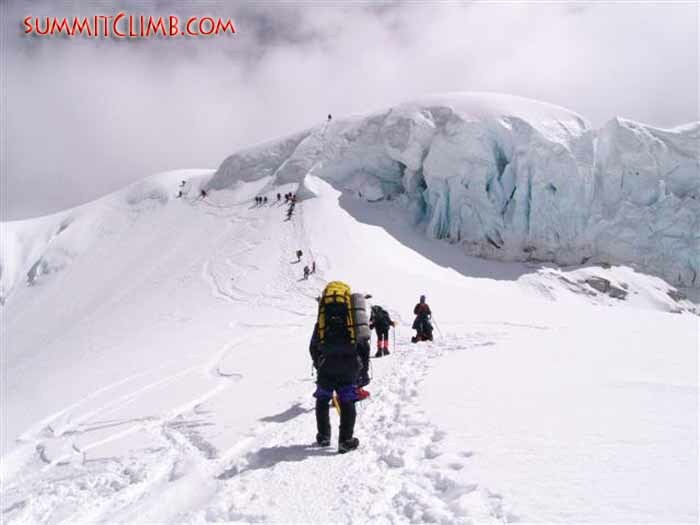 Cho-Oyu is an excellent choice for people looking to climb there first 8,000m peak or to prepare for Mt. Everest. 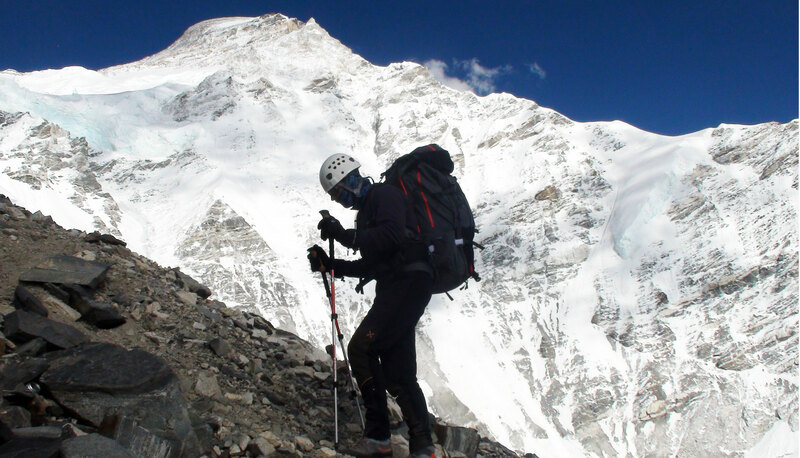 The amazing views, Tibetan culture, and easy climbing on Cho-Oyu make for a perfect big mountain objective. Two nights stay in Kathmandu hotel on arrival and two nights prior to departure in a double room. Private rooms are available for a small additional fee. Other services may be added for an additional cost. We recommend a three bottle set for Cho-Oyu. The price includes three large 4 litre Russian Oxygen bottles, mask, regulator, hoses, as well as carriage to the high camps by porters. Extra bottles are available for an additional fee. We have a 30% buy-back policy on masks, regulators, and unused oxygen bottles in good condition. 1) Arrive in Kathmandu, 1,350 metres (4,429 feet). Our staff will meet you at the airport. Stay at hotel. 2) Take passport to Chinese embassy for visa. Complete final logistics, orientation, purchasing, and packing. Stay at hotel. 3) Early morning drive to Rusuwaghadi at 2,557 metres(8,389 feet). Stay at hotel. Lhasa option: Fly from Kathmandu to Lhasa or if you are coming from a city in China, arrive in Lhasa on this day. 4) Enter Tibet, drive to Gyirong at 2,700 metres (8,858 feet). Stay at hotel. Lhasa option: Rest in Lhasa, tour Potala Palace and Jokhang Temple. 5) Rest & acclimatization in Gyirong. Walk around the local hills. Stay in hotel. Lhasa option: Drive to Shigatse. Rest and acclimate, Visit the 15th century Tashilunpo Monastery. 6) Drive to Tingri, 4,300 meters (14,107 feet). Stay at hotel. 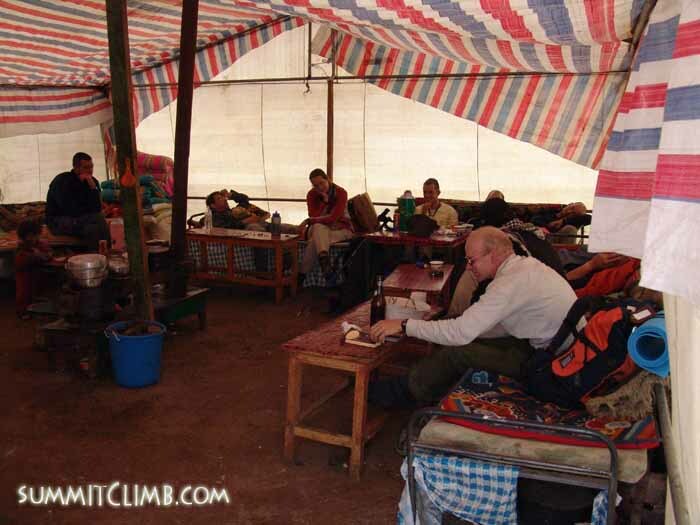 7) Rest and acclimatization in Tingri. Stay at hotel. 8) Drive to Chinese Base, 4,900 metres (16,076 feet). Camp. 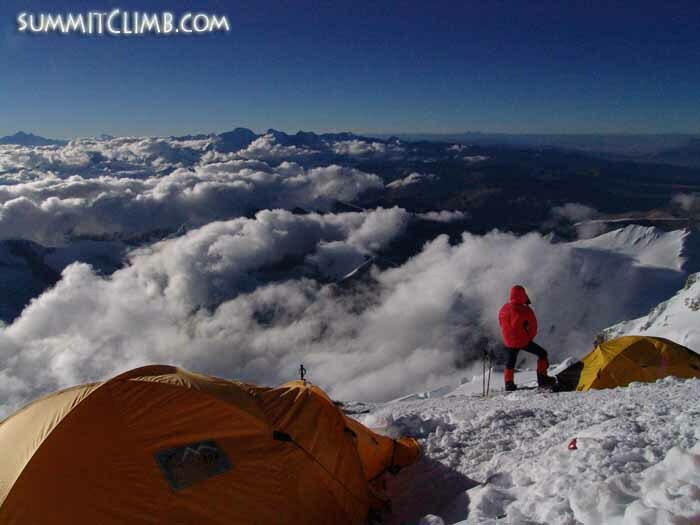 10) Walk to interim-camp at 5,100 metres (16,732 feet). 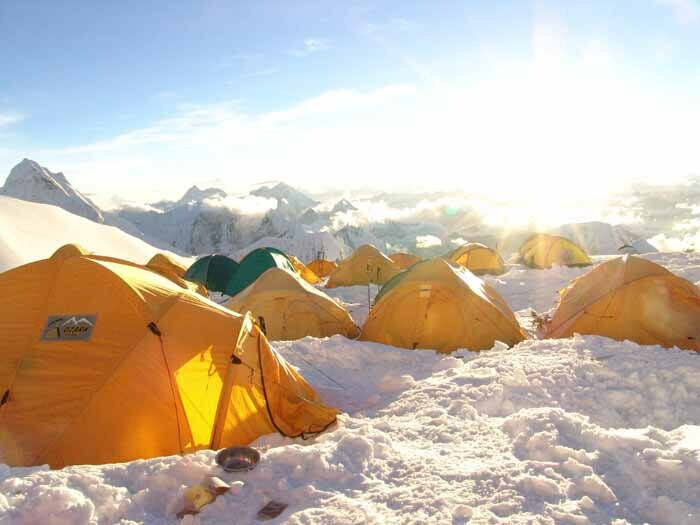 11) Walk to advanced base camp at 5,600 metres (18,373 feet). 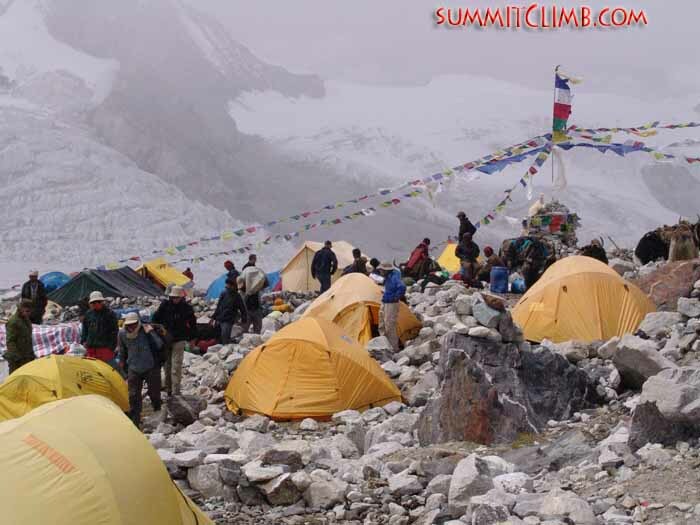 13) Walk to camp 1 at 6,200 metres (20,341 feet), return to advanced base camp. 15) Walk to camp 1. 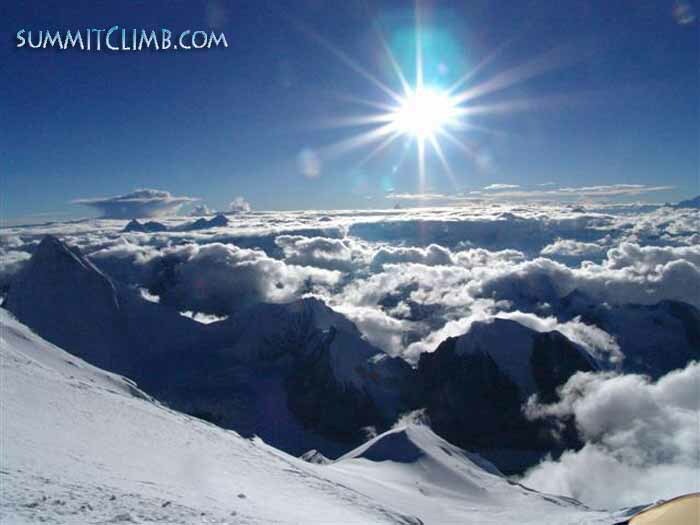 16) Walk to Camp 2 at 6,700 metres (21,982 feet). Return to advanced base camp. 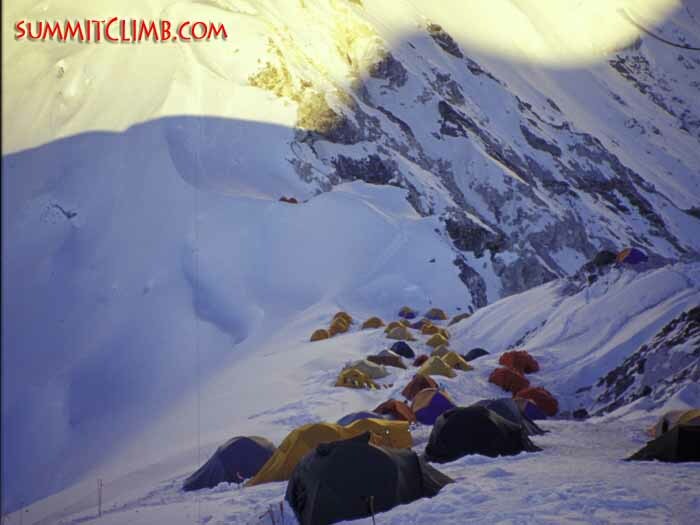 17) Rest in advanced base camp. 18) Rest in advanced base camp. 19) Walk to camp 1. 20) Walk to camp 2. 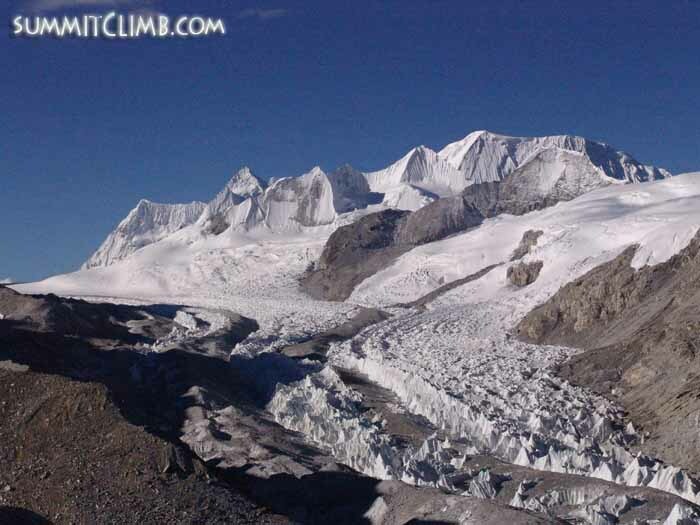 21) Walk to camp 3 at 7,400 metres (24,278 feet), then return to advanced base camp. 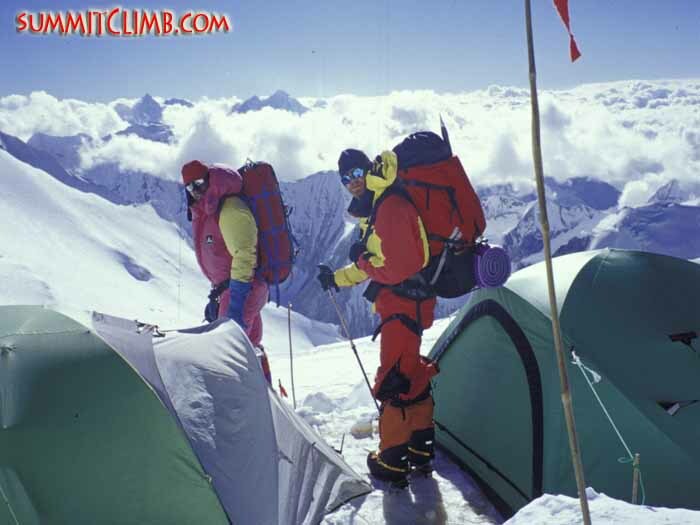 33) Descend to advanced base camp, pack and prepare to depart. 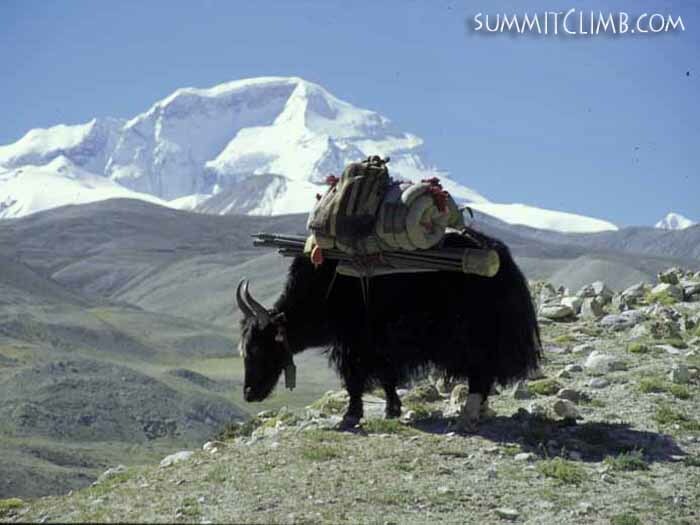 34) Yaks transport equipment, supplies and rubbish to Chinese base. Members walk down. 35) Drive to Gyirong. Stay at hotel. 36) Drive to Kathmandu. Stay at hotel. 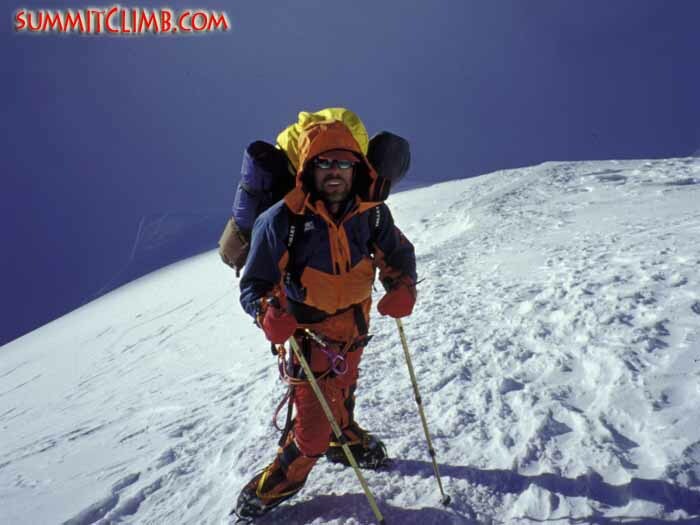 Leadership: Dan Mazur is a relaxed, friendly, well organised, and highly skilled professional with over 20 years of experience leading people to the summits of Everest, K2, Broad Peak, Gasherbrum, Cho Oyu, Lhotse, Manaslu, and Shishapangma. With expedition leaders Dani Fullier and Don Wargowsky (add links to leader’s pages) you will have an excellent experience on Cho-Oyu. Winter snow walking experience and experience at high altitude is highly recommended. The trip includes brief climbing clinics. 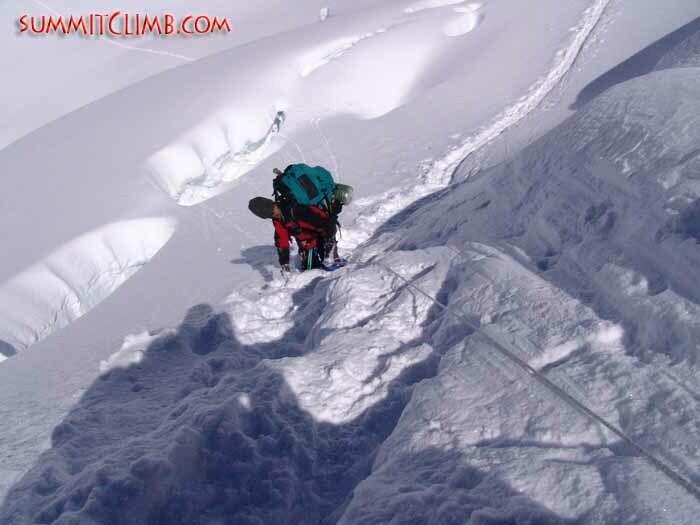 We will teach you everything you need to know on glacier near basecamp. 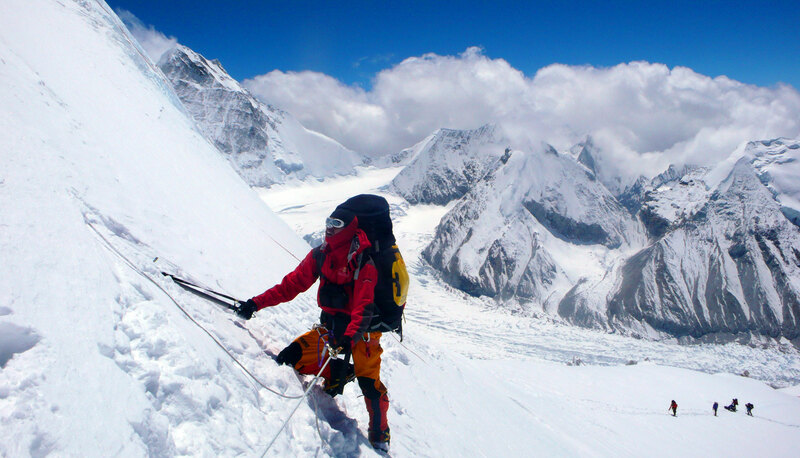 To be successful, proper conditioning is critical to your success on Cho-Oyu. Team members are expected to be very fit and in good health. Proper training with a focus on long hikes carrying a backpack is essential. "The trip was great! The team selection was great and I really enjoyed everyone. 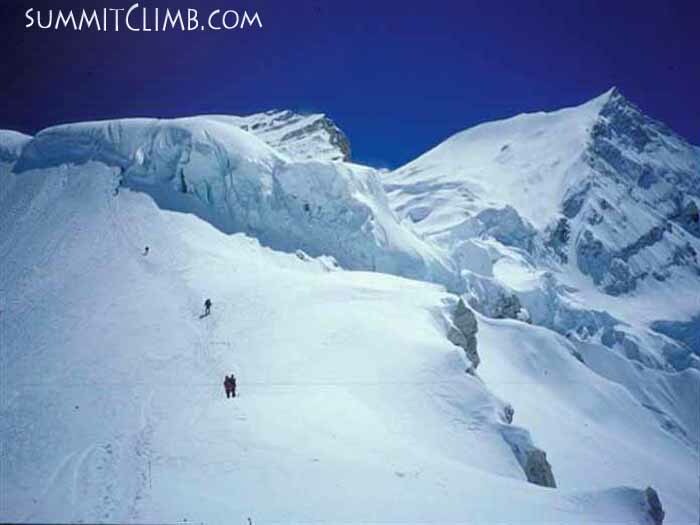 I thought the information we received pre-climb was very good and the suggestions for conditioning were right on. The sherpas were really amazing people and I enjoyed all of them. The food was delicious." 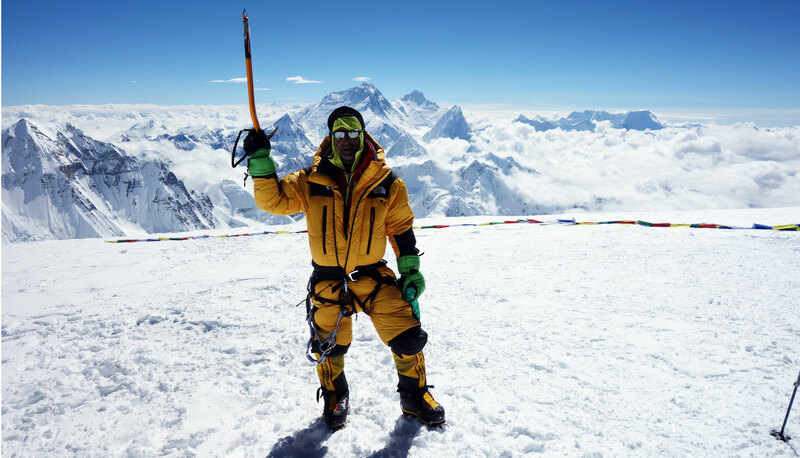 "I enjoyed the trip to Cho Oyu. I felt that the leaders were all very effective and that they went above and beyond their duty to facilitate a successful expedition." "I very much enjoyed dealing with all the staff. The leader was very professional and helpful. The Leaders in training were also great and trustworthy guys. It is worth mentioning that the expedition is a good value for the price." "The leader was a fantastic climbing leader and I look forward to climbing with him again. The Sherpas and leaders in training were very helpful at taking us around Kathmandu to acquire last minute gear. The staff did a great job organizing the hotels in Kathmandu. I was really impressed with the food at ABC. It was good and there was plenty of it, all with good variety. It was great that we ran a ropes course down on the glacier for everyone. I think it was helpful to several people and also was a fun way to spend the day." "I had a very good trip, I have nothing but good words about the organization and staff. I especially want to mention Arnold as a quite good and team organizer. I have no doubt I would not have succeeded in the climb if it weren't for him." 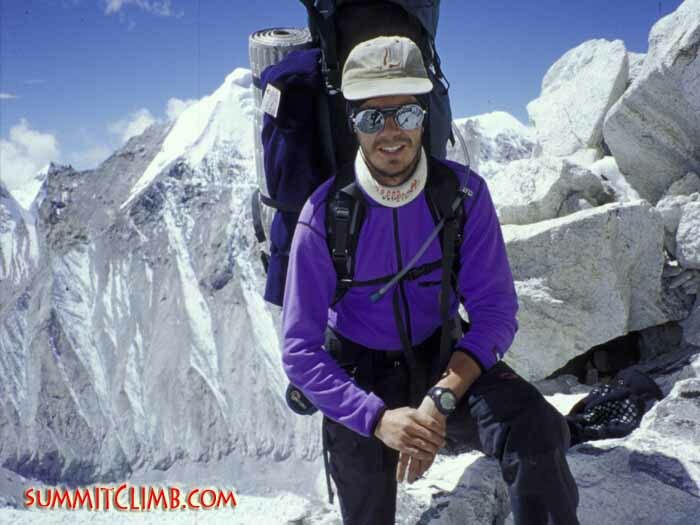 "Reaching the summit was a fantastic feeling - and made even better by a swift descent to ABC knowing that I would not have to climb the scree hill on the way to Camp 1 again (you will get to know that hill very well during the expedition!). Back in basecamp there were celebrations to be had in ABC and yet another brilliant cake from the cook tent!! 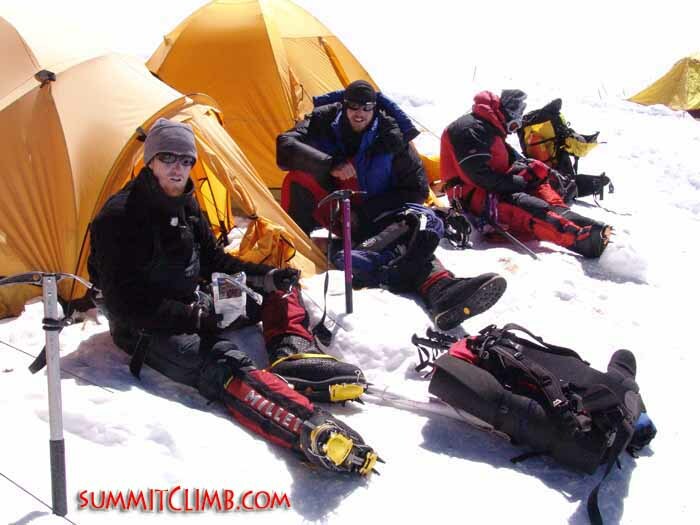 All in all, the Summitclimb expedition was a great experience - so much so that we are heading to Everest north side with them in the spring. 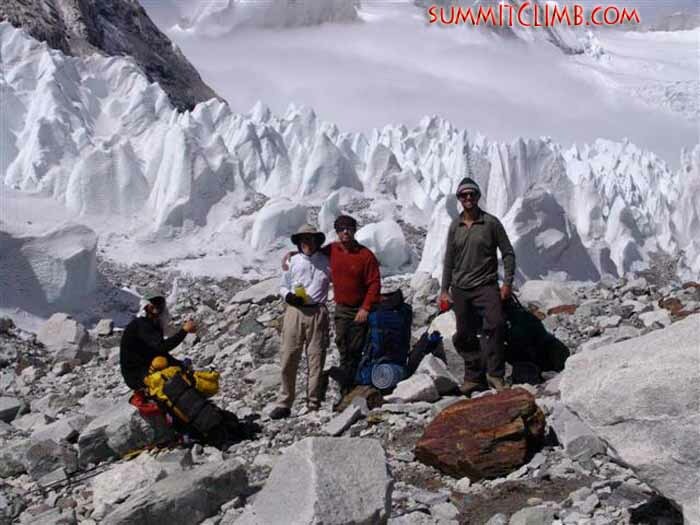 Everyone at SummitClimb's enthusiasm, the attention to detail and most importantly the feel that the expeditions are put together with people who enjoy climbing and mountains and the people who work and climb there make Summitclimb a great choice. Cho Oyu is one hell of a mountain. 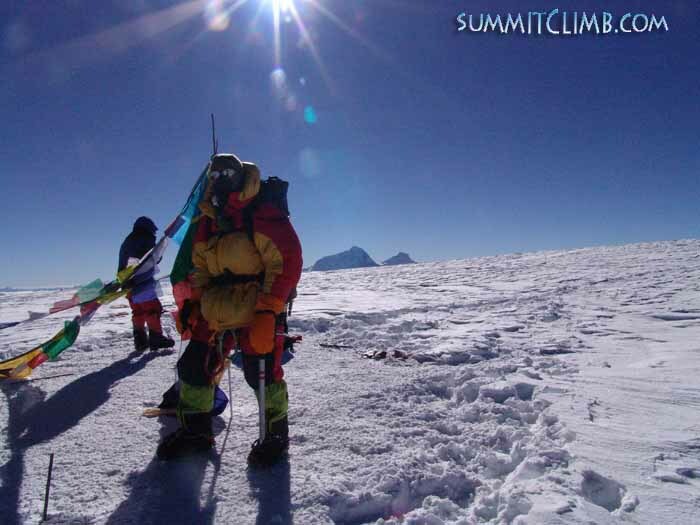 The feeling as you come up over the summit plateau and Everest pops into view beyond is amazing! Oh and when you see Everest clearly - stop climbing - you are on the summit!" "The western leaders are good. Each member has their own private basecamp tent. The food is good, with the cooks being skillful and friendly. Basecamp is a comfortable place to relax. The sherpas are excellent, strong and helpful. Cho Oyu is a do-able 8000 metre peak. Compared with other 8000 metre peaks, this is a short trip. 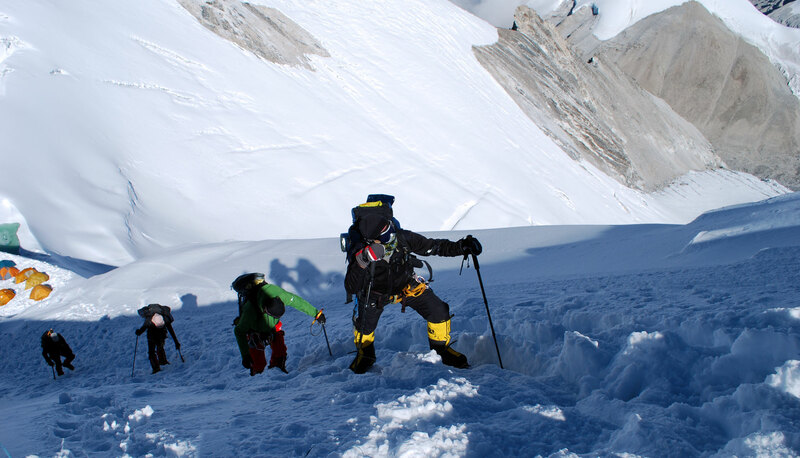 Within the team, members are very free to climb at their own speed, supported by sherpas and leaders. 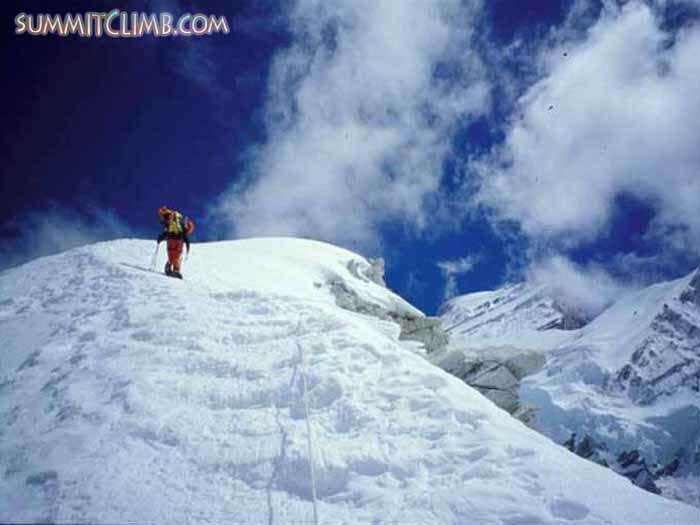 Cho Oyu is a nice test if you are thinking of Everest. The team members are friendly. 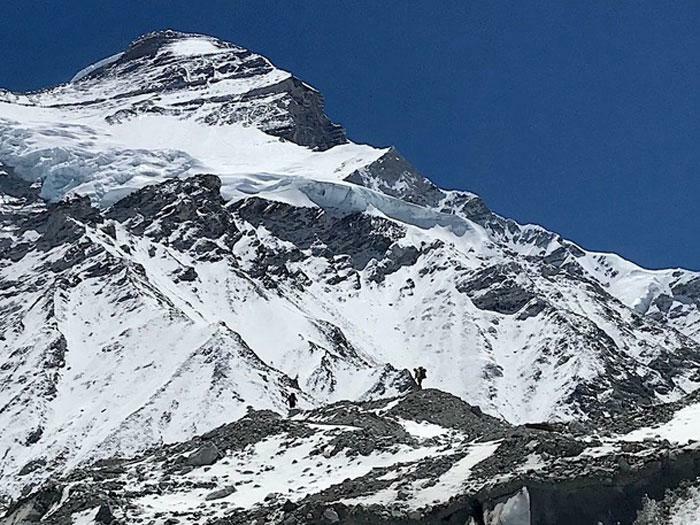 The cost for Cho Oyu is inexpensive compared to other 8000 metre peaks.